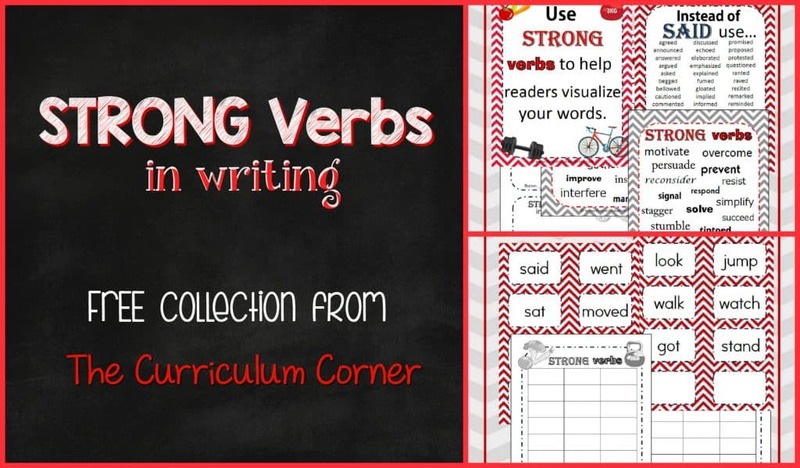 Use this collection of ideas to help your students choose to use strong verbs in their writing. As children become older and develop their writing skills, teachers are often looking to help them develop their verb choices. As a teacher, you are working to get them to use more words that help their readers visualize what is being said. These resources are designed to help you focus on choosing stronger verbs in their writing. Strong Verb Materials All of the materials for this collection can be downloaded via this file. A description of the included pages is below. Strong Verbs Anchor Chart This is to be printed and displayed as a reminder to writers. It might be a good addition to a writing center. Instead of Said Said is one of the most overused verbs in writing. Because of this, we have created an anchor chart filled with alternatives to using the word said in writing. Strong Verb Examples This anchor chart contains two pages, filled with a variety of strong verbs. This might displayed at a center or printed and placed in a writing binder for students to reference as needed. Practice Finding Strong Verbs Use a mentor text to help students practice identifying strong verbs. We think Seymour Simon books work well for this because of his word choices. To five students practice, read aloud your book of choice and have students record the strong verbs they hear (you might have students use the Strong Verbs in My Reading Page.) When finished, create a class anchor chart and as a class discuss the verbs – talking about what makes them strong verbs. More Practice! Give students a Strong Verbs in My Reading Page during independent reading time. Have students identify the verbs in their reading. Emphasize that you would like them to record only the words that help them visualize what is happening in the book. Another idea is to give students three post-it notes, have students record three vivid verbs and place in a common spot in the classroom. Paint Sample Center Place paint sample strips at a center. Print and laminate the red chevron cards that have simple verbs. Have students choose a boring verb card. Students write that verb on the edge of their card. Students then think of a more vivid verb to write on each section of the paint strip. These can be put together on a binder ring for a writing resource or students can create a pocket and store them in their writing notebook. Strong Verbs Writing Binder Insert This chart is designed for students to place in their writing binders. There are two versions, one with clipart, one without. When students encounter a verb they would like to use, they record it on their chart. Thank you for putting all of the materials in one pdf file, so we can save them all together! You put together terrific, helpful, and purposeful units always! So appreciated! Thank you for this week’s sharing!! !